The wave always moves so that to spend a minimum of own steps on the path traveled. Let’s look at the wave equation (up). It can be written in two forms: through the wavelength (top) and through the period (below). In a sense, the upper equation is more informative. In this case, the wave will move along the shortest path, that is, along a straight line. Conversely, if the wave trajectory is curved, then its wavelength changes along the trajectory. Knowing from the experiment the different trajectories of the wave movement, one can determine how its wavelength depends on the spatial coordinates. Looking ahead, I will say. Knowing how the light ray deflects near the Sun, one can calculate (without involving other assumptions) how the length of the light wave depends on the distance to the Sun. You can get a lot of interesting consequences from here. If we assume that the wavelength is a “step”, then the upper equation can be interpreted as follows. The wave always moves to spend a minimum of own steps on the way traveled. In scientific terms, it moves so that the optical path length is minimal. Consider the lower equation. According to it, the wave moves in such a way to make a minimum of its own oscillations over the distance traveled. In scientific terms, it moves so that the phase difference at the end and the beginning of the path is minimal. In this case, the wave will move so as to spend a minimum of time on the path. The trajectory of the wave can be curved. Conversely, the trajectory can be direct, and the frequency can be variable. There is not a rigid connection between the variability of the denominator and the curvature of the path, as in the upper equation. When light moves in a medium, its frequency remains constant, because it is the oscillation of the electromagnetic field in the medium. Therefore, the light in the medium moves so as to spend a minimum of time on the path traveled. This is the original formulation of Fermat’s principle. But we now know that the light is not oriented to our time (the observer’s clock), it moves so that to make a minimum of its own oscillations for the path traveled. Just in this particular case, the minimum of proper time coincides with the minimum of the laboratory time. I will repeat it once more. 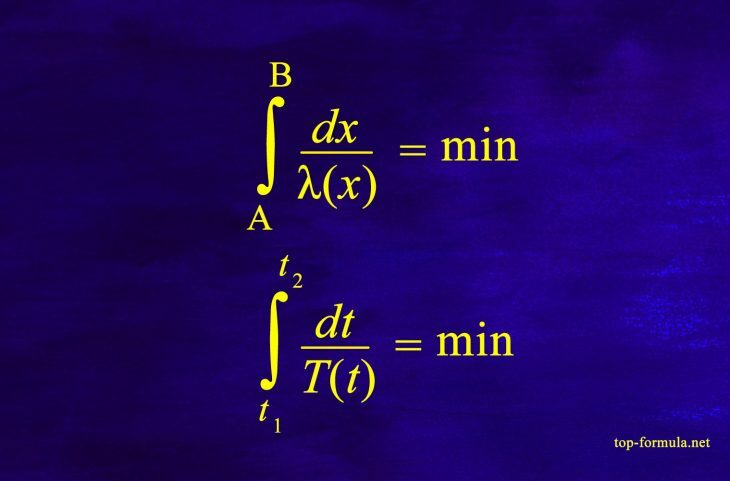 In the wave equation, dt is an infinitesimal time interval, measured by the clock of the observer. T is the period of the wave, also measured by the clock of the observer. After dividing dt by T, the observer’s time is “shortened”. We see that the light during the movement is not oriented to the observer’s time. It does not know anything about it. Therefore Fermat’s principle in the original formulation looked a bit “mysterious”, since it connected the movement of light with the clock of the observer. Tagged Fermat's principle Let's look at the wave equation (up). It can be written in two forms: through the wavelength (top) and through the period (below). In a sense the upper equation is more informative.